Unfortunately, emergencies can and do happen. When precious seconds can mean the difference between life and death, you want to be sure you've done everything you can to put the odds in your favor. 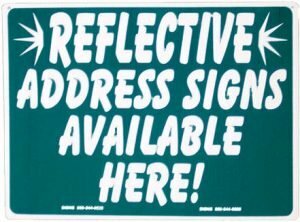 For $20, the price of a delivered pizza, our reflective address signs can help. Better visibility. Especially at night, when reflected by headlights and when it counts the most. Help 911, fire, and law enforcement find your home quickly. Low cost and peace of mind. An inexpensive way to help ensure home safety and security. Do I really need one of these address signs? My house already has numbers on it. To find out, drive or walk up and down the street in front of your house. Put yourself in the position of a rescuer that's racing to your house in a life or death situation. Can your address be seen clearly and easily from the street, at a distance, and especially at night? Statistics indicate that Emergency Services receive millions of phone calls per year for emergencies and accidents that occur at home. Rescue personnel will tell you that finding the home is the hardest part. Wasted minutes and seconds can mean all the difference. If you have numbers that can't be seen or are small, peeling, falling off, faded, etc. then the answer is YES, I need a new address sign. Help yourself and your community by making sure your home can be found easily and quickly. At the very least, your pizza will always be hot!